Jérome Skalski's interview with Étienne Balibar about the period surrounding Reading Capital was published in L’Humanité in March 2015. This translation by Patrick King and Salar Mohandesi first appeared in Viewpoint. 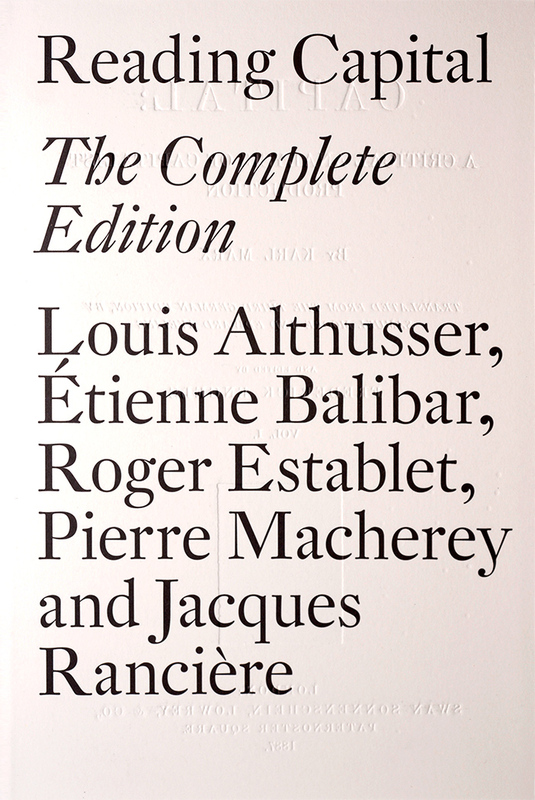 Reading Capital: The Complete Edition — the first unabridged English translation of the collective work, including contributions from Balibar, Louis Althusser, Jacques Rancière, Pierre Macherey, Roger Establet — is out now. 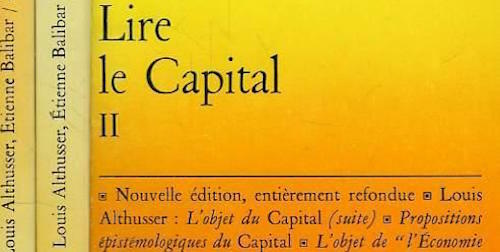 Jérome Skalski: Fifty years ago Louis Althusser’s For Marx, and, under his direction, Reading Capital, were published. What was the context of the debate at that period? Étienne Balibar: To put it very briefly, I would say that the question speaks to an intellectual and even academic dimension, and a political and ideological one. I belong to a generation that entered the École Normale Supérieure in 1960. That’s not irrelevant from an historical point of view. In our group, which was formed little by little around Althusser, there were students, of course, but also disciples. People who were a bit older, like Pierre Macherey, and later those a bit younger who came just after, the future Maoists, like Dominique Lecourt. That is, over the span of five or six years. 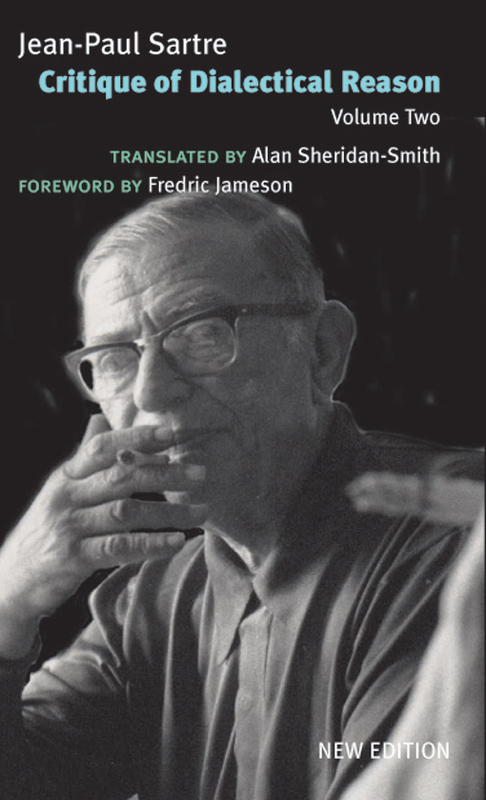 On the one hand, then, the year 1960 was two years before the end of the Algerian War, and the year that Jean-Paul Sartre’s Critique of Dialectical Reason was published. We had been politicized by the Algerian War. We were all UNEF militants, which was the first French union to meet with the Algerian unions linked to the FLN in order to coordinate actions against the war. This context was one of intense politicization and mobilization, but also very sharp internal conflicts. The basis of our politicization was mostly that of the anti-colonial and, consequently, anti-imperialist mobilization. The social dimension existed, but it came as a kind of an add-on. 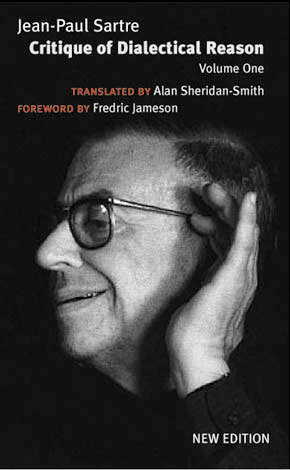 To give an idea of the period, I will mention 1961, the year following the publication of Sartre’s book. The main event of the “Semaine de la pensée marxiste” that year was the debate pitting Sartre and our own director at the ENS, Jean Hyppolite, the famous Hegel specialist, on one side, and, on the other, Roger Garaudy, representing the official line of the PCF in philosophy, and Jean-Pierre Vigier, Resistance fighter, physicist, philosopher, and a member of the Central Committee. This jam-packed debate unfolded in the auditorium of the Mutualité. The event was enormous. Althusser was professor of philosophy and agrégé-répétiteur, charged with preparing us for the agrégation examination.1 Obviously, his courses were not about Marxism, but all kinds of other subjects. He had nevertheless begun to publish in La Pensée, in 1961, a first article followed by several others, which had immediately provoked a lively debate within and outside the Party. This immediately drew out interest. We went to see him, and proposed to create a study group that progressively became a small team. Admittedly, it did not last long. It did not withstand, even before 1968, very sharp internal tensions, but for several years we worked together in a systematic way on both Marxism and the French philosophy of the time, of which, to our eyes, the grand event was the birth of structuralism. We organized a public seminar that lasted for the entire year. It was immediately published. It was at that moment that Althusser’s influence reached its height for a certain part of the intelligentsia of the Marxist or Marxisant Left in France. What were the orientations of Louis Althusser’s thought? I don’t know if I can summarize these things. First, although Althusser later performed a self-criticism to say that, in a sense, he had forgotten politics, I think that Althusser’s project had, from his first articles, a double dimension, political and philosophical. 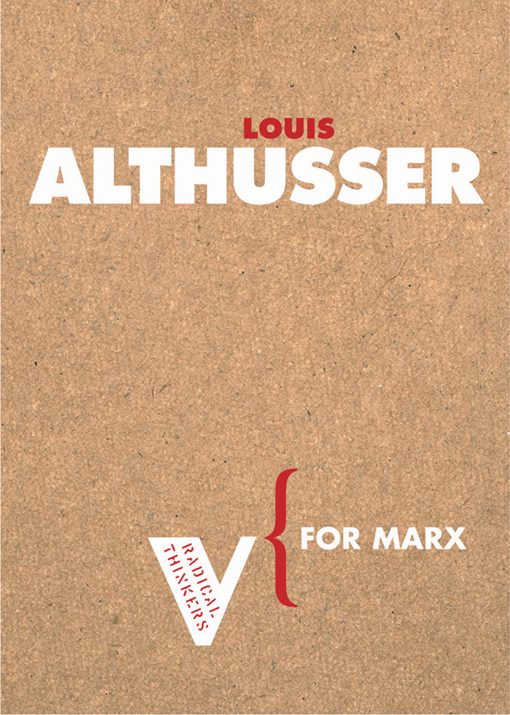 Obviously, one of the appealing aspects, and rightly so, of Althusser’s project for many young Marxists and even young philosophers more generally, was that he never wanted to sacrifice either of the two dimensions to the other. On one side, he wanted to make Marxism into a great philosophy and, on the other side, he had a very political conception of philosophy in which Marxism constituted, in the words of Marx’s eleventh thesis on Feuerbach, not only a way of interpreting the world, but of transforming it. All that might seem a bit distant today, but his intervention organized itself around the articulation of these two aspects of Marxism that Stalin had defined in a famous pamphlet, which, while certainly dogmatizing things, had, I think, a strong influence on Althusser. On the one side, dialectical materialism, the philosophical dimension of Marxism, and on the other, historical materialism, which is to say, the theory of history, and consequently, the theory of politics and of social transformation. Wasn’t Spinoza also a thinker of radical democracy? Philosophically, was Althusserian Marxism also a return to Spinoza? Althusser admired the Spinoza of the Theological-Political Treatise, but that was not the aspect that interested him the most. You are absolutely right to say that Spinoza’s thought is a radically democratic thought. This is a dimension that has come to the forefront for a while now, and which has been appropriated by a broad variety of philosophers some of whom effectively come from a Marxist background. However, this was not the aspect or dimension that interested Althusser. Not because he was hostile towards it, but because he fundamentally thought that radical democracy was a transition, an intermediary stage towards the dictatorship of the proletariat. From this point of view, he was a very orthodox Marxist. The dimension that he emphasized in Spinoza concerned the theory of ideology. With Spinoza, there is the first great materialist critique of ideology. Althusser defended a paradoxical thesis. I understand that it forcefully shocked many Marxists at the time but, on the other hand, it was very attractive to certain people among us. This idea was that the concept of ideology was the fundamental aspect of Marx’s theoretical revolution: not only the critique of bourgeois ideology, but the critique of ideology in general. To Althusser, this also appeared to be an important point within the debates internal to Communism at the time, in that it was dominated by the ideological complex he called humanism and economism. He thought that the Marxist tradition was weak on the question of ideology and that Marx, even if he possessed the genius to invent the concept, had had a very bad analysis of it. In Spinoza, he found the elements for a materialist theory of ideology that was neither Feuerbachian or Hegelian, and was not attached to a philosophy of history or to the concept of an alienation of man or a human essence. All of this paired very well with what was called Althusser’s scientism, such as it was expressed in the idea of the epistemological break and led to his proximity with structuralism. Althusser quickly criticized these positions in his Elements of Self-Criticism. What remains of Althusser’s philosophical intervention and the debates of the period for today? Obviously, in my view, we need a critique of capitalism that is adequate to the demands of the present. The demands of the present: these are globalization and the inextricably integrated character of the economic problem and the ecological problem. It is the emergence of new forms of governance, as we say, that are in part both infra-statist and supra-statist or post-statist. This is a generalized reworking or reshaping. We need a new critique of political economy and politics. Marx is not superfluous for undertaking this task, he is absolutely indispensable — he will himself emerge transformed from it. Althusser, in one of the last texts he wrote, designated Marxism as a finished theory. Obviously, that was a powerful play on words at the time. Everyone talked about the end of Marxism. Althusser said it was not the end of Marxism, but he underscored the necessity for Marxism to to define or delimit its own internal limits, its own historical limits. In a certain way, you could say that he became more historicist than he had been at the beginning. We have already entered a new phase in the interpretation of Marxism which, inevitably, is also perhaps a wholly radical transformation of Marxism. It will undoubtedly emerge from this transformation completely unrecognizable. From this point of view, what took place in the mid-1960s is very interesting. Not only for the theoretical suggestions that were made at the time and which have not been fully explored; in certain respects, Althusser’s self-critique had negative effects. But especially because of the fact that Althusser was not the only protagonist of this debate over the refoundation of Marxism. That was, in a certain way, the overarching common project between Marxists of different countries during these years. For myself, Althusser has a kind of biographical privilege, but there is not an absolute privilege. What he contributed cannot be measured and discussed if the perspective is not expanded or enlarged. In the 1960s, in the framework of German critical Marxism, there was a new reading of Capital (Neue Marx-Lektüre) that owed much to the Frankfurt School and was particularly focused on the phenomenon of social alienation as it was tied to the generalization of the commodity-form. This was something that Althusser did not know well or did not want to. There were the different strands of Italian workerism, the major figure being Mario Tronti, who wrote, at the exact moment as Althusser and his group, a rereading of Capital that on certain points matched up with Althusser, and on other points diverged. But we can enlarge the perspective even further with the critical Marxist currents coming from Latin America, and then the tradition of Marxist history exemplified in the Anglo-Saxon world by Eric Hobsbawm, Maurice Dobb, Christopher Hill, or Perry Anderson. If we return to 1965, we see a Marxism in full bloom, fully in contradiction with itself. On the one hand, there is the deadweight of the crisis of state communism, on the other hand revolutionary hopes: in the midst of all of this, a capacity to renew the links or connections between Marxist philosophy and living philosophy. We cannot begin again in exactly the same way, but this period certainly holds a positive notion for today. Reading Capital: The Complete Edition is out now.